Who owns your passport? By law, passports are owned by the states that issue them, not by the people who hold them. Lives in Transit (2018), the site-specific art installation that anchors Houghton’s current exhibition Passports, seeks to address this question in its display of expired and cancelled passports bought by the co-curators on e-commerce sites. Bound as small books, they belonged to people living in the twentieth century from diverse countries –some of them now extinct (such as Yugoslavia, the Soviet Union, the German Democratic Republic, and Kingdom of Serbs, Croats and Slovenes). Having been deprived by time of their original function as legal documents, these passports have entered the realm of trade, and now they are displayed as both pieces of art and memory. 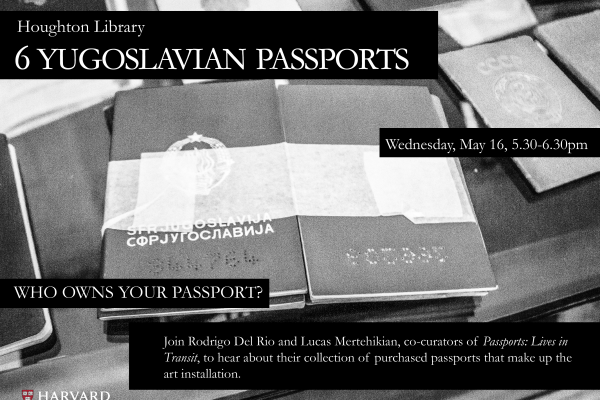 Join Rodrigo Del Rio and Lucas Mertehikian, co-curators of Passports: Lives in Transit, to hear about their collection of purchased passports that make up the art installation.